is the turn (or bend), curling solidly around the Black stones, stopping their advance while radiating influence towards the top and right, in addition to possibly making a significant amount of territory depending on the position. 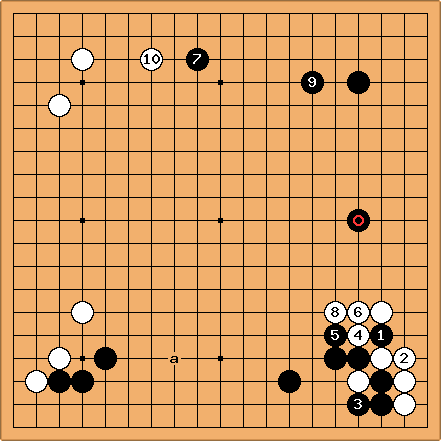 is an example of a turn played by Fujisawa Shuko against Ishida Yoshio in the 1971 Honinbo League played on 7 April 1971. Shuko considered the value of the turn to be large enough that he was willing to relinquish sente. This move enables White to invade the lower side at a and cuts off the marked black stone from the lower right corner. A bend of particular tactical or strategic importance can be called senryo-magari (千両曲がり), or "million-dollar (euro) turn". The ryo was a historical Japanese unit of currency. In 1700, a ryo was equivalent to 225 grams of silver (current value: USD1700), or one "koku" of rice, the amount needed to feed one person for a year at the time. Later, the ryo became the yen, when it was still worth something. See also jumping turn (tobi-magari) and turn to move.